To play this event, you must command three personnel. 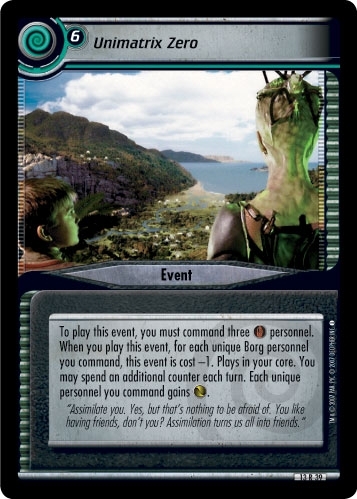 When you play this event, for each unique Borg personnel you command, this event is cost -1. Plays in your core. You may spend an additional counter each turn. Each unique personnel you command gains . "Assimilate you. Yes, but that's nothing to be afraid of. You like having friends, don't you? Assimilation turns us all into friends." Characteristics: plays in your core, reduce your card play cost, spend additional counters, Alternate universe related. There are 17 entries for Unimatrix Zero (ST2E 13 R 39) at the Tradeplace (8 haves and 12 wants). Click here to see all trade list entries for this Rare card! Also see here for all trade lists with any card fom "In A Mirror, Darkly".